Have you ever wondered why people use Twitter? Do you know the benefits of using Twitter and Twitter chats to grow your small business? Do you even know what a Twitter chat is? 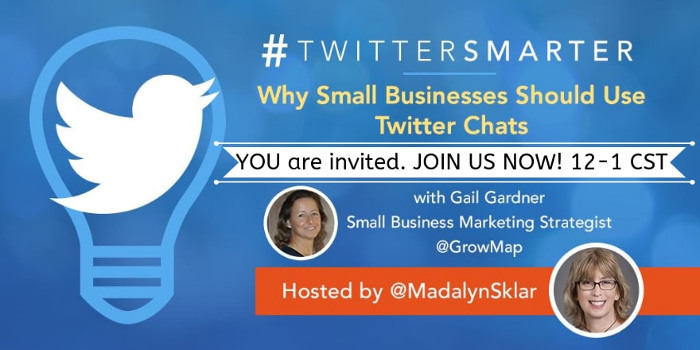 Join me, Gail Gardner, your BizSugar Mastermind Community Manager, as I make a guest appearance on Madalyn Sklar‘s #TwitterSmarter Twitter chat. Twitter chats are not some wild and complicated thing. They are simply a way for Twitter users to agree to interact during a given time (usually 1 hour) by adding a hashtag to their tweets so that other participants can see them. Anyone with a Twitter account can join in. The typical format is for the host to answer questions numbered Q1, Q2, Q3, etc. Then to respond, type A1, A1, A3, etc. and then your answer followed by the hashtag. You can answer any question you like or just lurk. Interacting with other people who are answering is also encouraged. The Twitter chat #TwitterSmarter is one of the largest and longest-running Twitter chats. Because they use many questions, and have a strong and loyal following, this chat often trends. If you are new to Twitter chats, this chat may fly by so fast you may find it challenging to keep up. See my tips (below) for how to enjoy the chat and not worry about all the tweets you cannot possibly see. #TwitterSmarter happens every week on Thursday from 1 p.m. Eastern to 2 p.m. ET. If you can only attend one or a few chats, this is one that will improve your skills at using Twitter and Twitter chats for business. There is also a #TwitterSmarter podcast. Understand that you cannot possible read all the tweets — much less respond to them — unless it is a really slow Twitter chat. So here are some ways to make sure you don’t miss the best tweets. From the home page of Twitter, click on notifications (or open this link). This is where you will find any tweets directed at you personally. Search for #TwitterSmarter and make sure you click on “Latest” or open this link. Open another tab for the host of the Twitter chat. For this Twitter chat, the host is @MadalynSklar. In a fourth tab, open the guest’s Twitter account. In this case, that would be @GrowMap. If you’re brand new at this, just focus on tab #3 (the host of the chat). The questions will appear there and any other tweets the host makes. What to do if you forget the hashtag on a tweet? Don’t worry – we’ve all done it! Just copy and paste into a new tweet, add the hashtag, and send it. Then delete the first tweet. Once you feel comfortable, you can switch over to tab #1 (your mentions). Until you tweet, there probably won’t be any there specific to the chat. To see all the tweets, open tab #2. But be warned, they will fly by and you can’t read and reply to all of them. So just let that go. Some participants choose to answer questions using video. But here’s the catch: unlike on Facebook, you cannot listen to their reply unless you sit there and stare at their tweet. If you switch to another tab or try to scroll up or down the page, the video will stop. Anyone new to Twitter chats should probably just ignore videos for now. You can go back and read everything that was tweeted after the Twitter chat is over. If you are good at multi-tasking, you can watch the videos on another device (different computer, or your Smartphone or Tablet). People who love Twitter chats continually flip between tabs and sometimes use multiple devices. But you don’t have to do that. Why Should a Small Business Use Twitter Chats? Want to find out? Join us tomorrow for #TwitterSmarter! As you know that social media play an important role in marketing.Twitter is one of the best platform for marketing. Never even knew about twitter chats until now. Thanks for a great post!